You will find an amazing choice of products and accessories for your livestock or horses at Farm & Country Supplies. We have a host of items for the care and well being of your animals, from treatments and supplements, to troughs, hay racks and pitch forks. Our range of hay racks are designed to bring the maximum in convenience with no nonsense products. From wall mounted hay racks to hay baskets, we have the right items for your livestock and horses. We have a choice of lightweight hay racks, or heavy duty hay racks for horses and cattle. For horses and cattle, we have the heavy duty galvanised hay rack. This tough food rack is sturdy and built to take some punishment. We also have the option of wall or corner mounted hay racks, so there's every option available to get the best placement for your animals. Along with the heavy duty range of hay racks, we also have the lightweight hay racks for livestock such as ponies, sheep and goats. The lightweight hay racks are also available in corner and wall mountable versions, which come complete with four mounting brackets. These are ideal for fitting in pens, and can be easily checked to see if they need refilling. 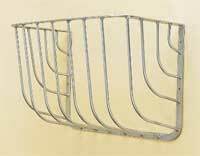 If it is not feasible to wall mount a hay rack within a stable or pen, we also have the galvanised hay basket. Measuring 475mm x 475mm x 490mm deep, this hay basket can hold a sufficient amount of hay. No matter your requirements for feeding your animals, we have the solution for you. Take a look through our selection of products for feeding, care and welfare of your livestock and horses. You'll find everything you need right here at Farm & Country Supplies.